Lace up your boxing gloves: The mighty 6Blocc pits Trap against Juke in this epic mashup pack from Industrial Strength Samples. Enter the ring for a battle of the styles. In one corner, the edgy tones of Southern Trap are primed to bring the heat; in the other, Chicago's signature Juke awaits with fancy Footwork. This Audio soundset dukes it out in your Daw with tenacious Loops, dirty Effects, and deep Sub Bass. You'll also find cinematic Synth Loops and tight Synth Bass, along with critical One Shots and Drum Loops for round upon round of ear-busting blows. Throw sonic punches in Trap, Juke, Dirty South, Hip-Hop, Dub, Footworkz and any modern EDM style. This pack is ready to strike Ni Battery 4, Maschine, Kontakt and Logic Esx with 24-bit, 44.1 kHz audio precision. Choose your moves in Wav, Apple Loops, and of course Rex.2. The Samples are tempo-marked and all wound up so you can deliver the knockouts you need in your next production. 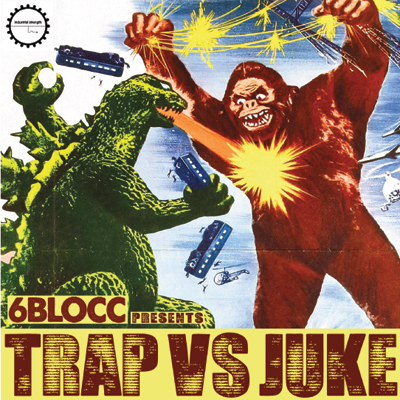 Trap Vs Juke was designed with the 6Blocc chops that twisted Dubstep remixes of Fugees, Dr. Dre, Method Man & Redman, and Bone Thugz n Harmony. Hailing from L.A., 6Blocc has been heard collaborating with Cypress Hill producer DJ Muggs and San Fran's Bassnectar. On top of running his 6DUB label, his recent releases can be caught on Foul Play, Ultra, Terminal Dusk, Moonshine, Mad Decent, and Lo Dubs. This man's music never relents. 6Blocc has been storming the ISR studios with a series of searing packs. For more flash, fury and fire, check out Footworks/Juke Production Tools, Trap Massive, Micky Flair, Dirty Alley Breaks, Dubstep Ammo and Hard Talking. ISR's Trap Vs Juke is set to dance circles---Ding Ding Ding ….Let the style wars begin !